This section presents a less satisfactory design solution than the preferred design (SNRP Option 1) as it is only a small variation to the Reference Design. It is has been included here as a feasible variation (‘further option’) to the Reference Design that may fit within the current project boundary. However, it still comes at a cost to parkland and does not avoid significant long term impacts on the health and wellbeing of residents and the local environment. It is appreciated that the tenderers are expected to propose variations to the Reference Design that may avoid, mitigate or manage the impacts. However it is also understood that the tenderers are expected to deliver the lowest cost bid within the project boundary. As a result they are constrained in their ability to develop innovative design variations that significantly reduce impacts as we understand that the tender assessment will be completed by Treasury and independently of the Assessment Committee and the community. Should the CIS be approved and the SNRP’s preferred design (Option 1) be rejected by the Committee, it is hoped that the Committee would place stringent conditions on the approval to ensure the significant impacts on Royal Park are mostly avoided in the development of the final designs. There are better ways to make the connection from the tunnel to City Link given that the SNRP has developed many alternative designs since May 2013 and presented the latest iteration in the submission to the Committee in December 2012. The City of Melbourne has adopted a similar approach to SNRP Option 2 for one of the designs that were included in the Council’s submission to the Committee. Interestingly, the SNRP presented it designs to the Council in August 2013. The above map describes the design of the SNRP option 2 on Ross Straw Field. The small but critical change that has been introduced by the SNRP in the derivation of this design has been the modified orientation that allows many of the impacts to be significantly reduced. This SNRP design innovation was adopted by City of Melbourne management in the development of the third alternative design in the Council’s draft submission to the PAC. The second significant SNRP innovation has been inclusion of on and off ramps at the CityLink connection, which means that the Elliott Ave interchange is not required, a significant environmental and economic advantage, which would mean that the total project cost is similar to the cost of the Reference Design. Tunnels extend to Oak St and therefore Ross Straw Field can be restored after construction. 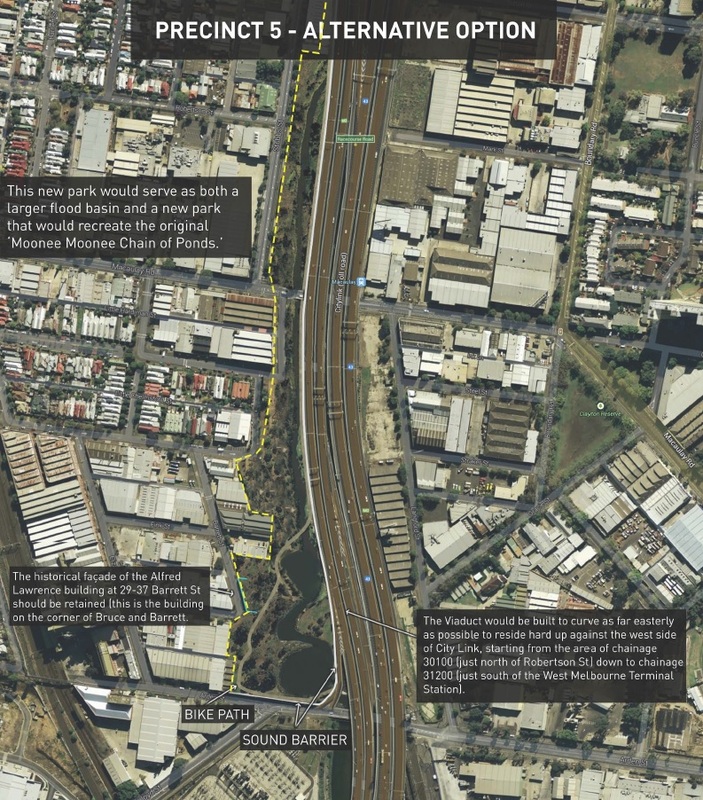 A connection could be made directly to/from the City Link sound tunnel in the first instance but also be connected to a viaduct on the western side of City Link if this was considered necessary for Part B. However, we note from the City of Melbourne submission that this duplication of City Link may not be required, which would be a fantastic outcome for Moonee Ponds Creek. It is entirely within the project boundary and supports the intention of the Urban Design Framework. The new parkland would be safe and welcoming, and enhance the Arden Macaulay Structure Plan. The undercroft spaces of the alternative viaduct could be utilized as secure Vic Track storage area, or used for new rail yards. Also simplifying any future need to construct grade separation at Macaulay & Arden. There will be greater room for the West Melbourne Terminal Station, which SP-Ausnet has made comment in its submission about the untimely risk the EWL project places on its refurbishment footprint. New native parkland area could be created, ~4.2 ha, the first in years within inner Melbourne. It would show a strong commitment from the project to history and the environment. It would undo years of neglect in the Kensington area and be a positive news story for all parties. The Capital City trail would be transformed.